Derby Duel: Romagnoli vs. Jovetić – AC Milan Bros. This Sunday will see the San Siro host the first Derby della Madonnina of the season. Both Milan clubs will be looking to grab all three points from this traditional fixture and, more importantly, earn a victory in one of the most heated rivalries in Italian and world football. There will be plenty of key match-ups to keep an eye on throughout the match, but one battle in particular is how Milan’s Italian U-21 central defender, Alessio Romagnoli, will deal with Inter’s man in form, Stevan Jovetić. The Montenegro international has been immense for the Nerazzurri since joining on loan this summer from Manchester City. How Romagnoli manages to limit the former Fiorentina man from threatening Milan’s goal throughout the match could be a huge implication of the outcome of the derby. For Romagnoli, not only will he be looking to keep Jovetić at bay, but he’ll also be looking to keep Milan’s first clean sheet of the season. The former Roma youth product has been the key piece Milan’s defense has been missing for quite some time now. He has been impressive throughout pre-season and the Rossoneri’s first two matches of the season since joining from the Giallorossi this summer. He has looked comfortable on the ball and is adapting well to his new club, showing his defensive ability in the back, which has made life a bit easier for goalkeeper Diego Lopez. These are two player traits that Milan has been missing in their central defenders and with a good start to his new career with the San Siro outfit, Romagnoli looks to prove that a 25 million euro fee was money well spent by his new club. “From now on, Romagnoli will not be judged as a youngster but as someone for whom €30m [€25m] was paid.”To live up to the hype that has now surrounded him, Romagnoli will need to show Milanisti that he is worth the steep transfer fee that was paid for him with a strong performance in central defense for the Rossoneri”. To live up to the hype that is now surrounding him, Romagnoli will need to continue playing well and help his Milan side earn all three points over their bitter rivals. It will be interesting to see who partners Romagnoli in defense as coach, Siniša Mihajlović, will have the option to use Rodrigo Ely to partner Romagnoli although the former Sampdoria boss may elect to choose the more experienced Cristian Zapata to start over Ely. The ex-Avellino defender has completed his one game suspension and will be available to play in the derby. 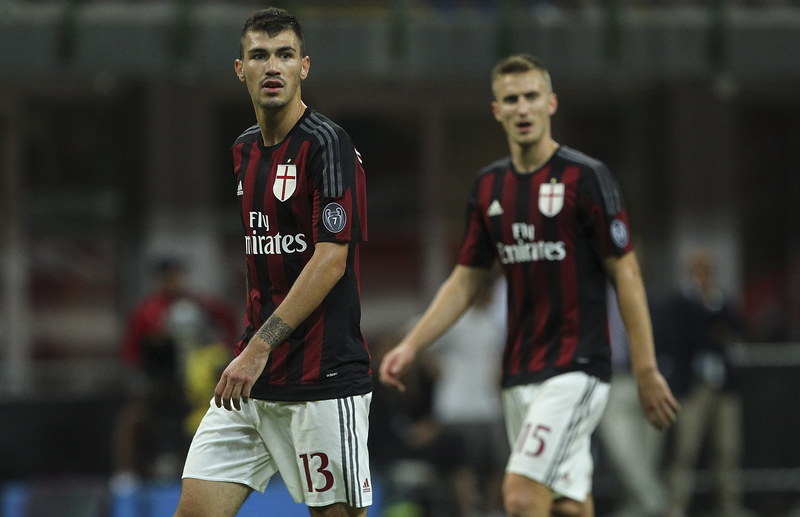 Regardless, Romagnoli will be in the spotlight when the derby kicks off on Sunday evening. Trying to prevent Romagnoli from having shining and Milan from taking all three points will be what Stevan Jovetić has in mind. The former Manchester City man has been fantastic for Inter scoring in both of the Nerazzurri’s games so far with a total of three goals. Jovetić will be looking to continue his streak of scoring in every match as he leads Inter’s attack during the derby. The clash between Jovetić and Romagnoli will be a key match-up as both players have something to prove in their first of perhaps many Milan derbies. A match of this importance will allow either one to do just that. Romagnoli will need to make the right challenges and close down gaps from allowing the Inter striker to shoot from outside the box. Inside the box, Jovetić can be lethal as well. Romagnoli will need to have effective communication with his partner in central defense and also with Diego López, who will need to be aware in Milan’s goal. The battle on the pitch between Romagnoli and Jovetić could determine the winner or loser of the match. It will be one of the most important match-ups to keep an eye on throughout the match and whoever comes out of this battle victorious could end up being the hero of the newest installment of the Derby della Madonnina.